the oldest Klezmer ensemble in Texas and the Southwest. Founded in 1979 by Bill Averbach, the group is comprised of some of the finest Texas musicians playing a mix of Eastern European, Middle Eastern, S. American, Jazz, and Texas music that is not as foreign as one might imagine. These pages are designed to give you a feel for what the Austin Klezmorim do and how we can enhance your organization's programming over the next few years through concerts, workshops, school presentations, master classes, and more. The Austin Klezmorim and the Texas Commission on the Arts programs can extend your resources in a very positive way. You can't go wrong with the best in Texas Klezmer. 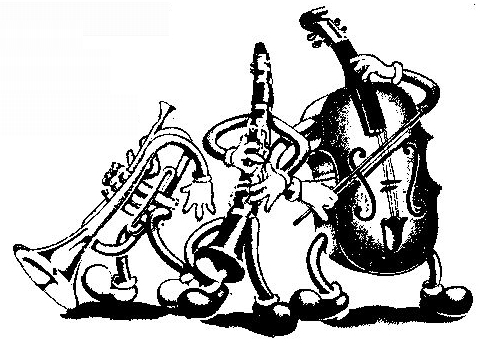 The Musical Genre - What is Klezmer? The History of Klezmer - Where did Klezmer begin and where is it now? How did the music change as a result of influences from technology, politics, communication? The Band - Who are the Austin Klezmorim? Contact Us - If you want more information or you would like to book the Austin Klezmorim we encourage you to email us.